Fronted by the 8-time champion jockey turned broadcaster and journalist, (Peter) Scudamore’s Super Stakes takes video slots players to a day at the races. Created by NetEnt, it’s a 5 reel 20 payline video slot that comes with plenty of extras including up to 5 extra wilds that can land on any spin, a side bet feature where collecting symbols can deliver multiplier rewards as well as free spins round where backing a winner can result in a bonus of up to 5,000 times your bet. Play on all devices from between 20p and £100 per spin. 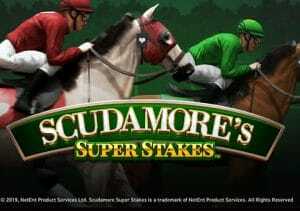 The sound and visuals in Scudamore’s Super Stakes are just what you’d expect from a horse racing-themed video slot. Green dominates the reels which are set against a parade ring backdrop. Joining the lower value A to J royal values are a quartet of higher value horses. The best of these is the grey with the jockey in red colours which offers payouts of up to 12.5 times your bet per payline. A very young looking Scu in racing gear is the wild. He substitutes for all of the standard symbols. As we mentioned in the intro, there’s a good selection of extras on offer in Scudamore’s Super Stakes. Random Wilds feature – between 2 and 5 horse shoes can appear anywhere on the reels on any spin. Each position the horse shoe lands on turns into a wild. A new payout calculation then follows with the extra wilds in place. Bet Slip feature – no day at the races is complete without a wager or 2 and this video slot allows you to place a side bet if you wish. Prizes are on offer if you manage to collect a minimum number of a chosen symbol within a specified amount of spins. The odds vary depending on what symbol and how many spins it will take you. There are plenty of options here though if you want to add something on the side to spice up the base game. Peter’s Classic Cup feature – land 3 scatter symbols on reels 1, 3 and 5 to trigger this round. Here you’ll be awarded some free spins on an expanded 5 reel, 4 row, 32 payline machine. There’s a second element to this round too – underneath the reels you’ll see a 4 horse race. If you select Tin Foil Hat (the J symbol) and it wins you’ll get a 50 times bet prize. If you select Gonzo’s Quest (the Q symbol) and it wins you’ll get a 100 times bet prize. If you select Berry max (the K symbol) and it wins you’ll get a 500 times bet prize. If you select Divine Fortune (the A symbol) and it wins you’ll get a 5,000 times bet prize.